After his virulently an anti-Zionist speech at the United Nations General Assembly on Tuesday drew reactions the world over, a group of Neturei Karta rabbis met in Manhattan on Wednesday with Iranian President Mahmoud Ahmadinejad. During the meeting members of the delegation presented the Iranian president with a $700 silver trophy as a sign of friendship. Rabbi Yisroel David Weiss, who took part in the meeting, told Ynet the encounter was “very successful” and was conducted in a warm and friendly environment. 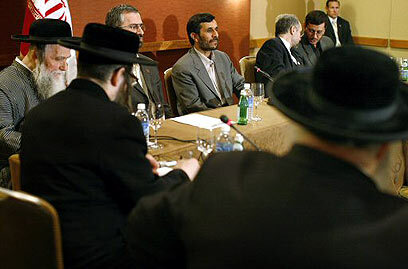 Rabbi Weiss said the delegation thanked Ahmadinejad for his positive treatment of Iran’s Jewish community. The difference between Zionism and Judaism was discussed in the meeting as well. Explaining the common thread between Neturei Karta and Ahmadinejad, Rabbi Weiss said, “The Iranian President understands the difference and understands that not everyone bears the Zionist outlook. “Not everyone wants to see the destruction of Judaism and participate in the Zionist infidelity but rather solely to pray and hope for the end of the State of Israel,” he said. According to the rabbi, the Iranian president does not deny the Jewish Holocaust, but rather resists what he calls Zionist invasion and occupation of the land of Israel and the suffering caused to the Palestinians. “The Zionists use the Holocaust as an excuse for their crimes,” said Weiss. According to him, there are also Jews who are loyal to the Torah and against Zionism for its denial of God. “Ahmadinejad, like us, understands the difference between Judaism and Zionism,” claimed Rabbi Weiss who emphasized that the Iranian president is not looking for ways to bomb Israel. “It is the complete opposite; he wants peace and not to destroy the Jewish nation, that’s what he explained to us. He is against the difficulties generated by the Zionist nation against the Palestinians,” he said. The Neturei Karta representative responded to President Shimon Peres’ comments, “Throughout the generations, God told us that the Torah is our protection. “Due to the Zionist leadership’s denial of the Torah and diversion from its path, the warnings written in it are being ignored. This is likely to bring the Jewish nation to catastrophic outcomes as we see today and this is what we are fighting against,” said Rabbi Weiss. 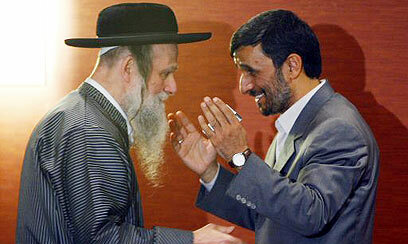 See all talkbacks "Neturei Karta: Ahmadinejad wants peace"